1. Weight - In the top right corner of section one you will see your weight and again at the top of section two. 2. Lean Mass - Below weight, in the second section, you will see your lean body mass. This is how many pounds of muscle you have. You will compare your next reading to see how much lean mass you lose/gain. 4. 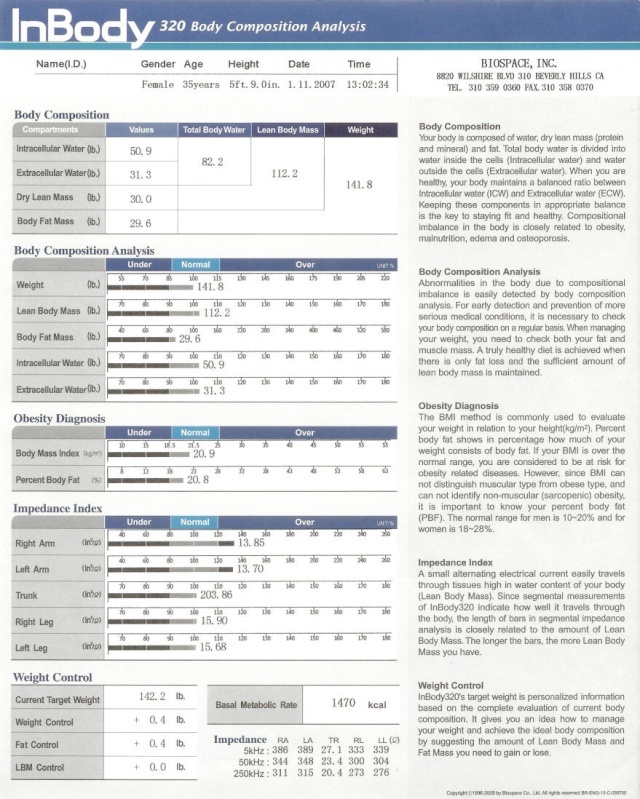 Body Fat Percentage - This is located in the 3rd section marked Obesity Diagnosis. The fist line shows you how much mass you take up but doesn't reflect if fat or muscle, just overall size for your height. The percentage of body fat is reflected by muscle and fat. As you gain muscle, your body fat percentage goes down. As you lose body fat, it goes down. As you gain muscle and lose body fat it REALLY goes down. 5. Lean Mass Distribution - The 4th section are graphs that reflect your lean mass. This shows where you are carrying lean mass. This shows what areas you need to build. If your lean mass is over in one section, that is good. Heavier people normally have more lean mass because they are carrying their weight around. If you are 50-100 or more overweight, it is likely you'll lose some of the muscle as your body won't need it anymore. We want to retain as much as possible, but it's not the end of the world if you lose some. Lighter people need to preserve muscle mass as much as they can. Increasing protein is the only way to gain muscle or to avoid losing it. 6. Basil Metabolic Rate - This is the bottom right section. (here it is marked 1470) This is how many calories this person burns at rest. This has little to do with how many calories you burn, but it can give us an idea of what your progress should be if you are taking in 1200 calories a day. This number is reflected by lean mass. The more lean mass you have, the higher the number. Heavier people burn more calories while thin, shorter people burn fewer calories (it takes less calories to run them). Think of it like a car. It takes more to run a big excursion than it does a Honda Civic. 7. Your goals - At the bottom of the page where it is marked weight control it will tell you your current weight, how much weight it wants you to lose or gain and where it wants you to make changes. For instance, it may tell you it wants you to lose 10lbs of fat but it wants you to gain 4lbs of muscle so the weight control would say 6lbs.